Today’s review of Kobold Press Gudies comes from Sarah Jasmine Stork, who graciously agreed to play mediator in the great Gnome/Kobold war and review the products on our behalf. Kobold Press sent her review copies. Thanks! I have been casually playing D&D for nearly 15 years and, to be honest, I’ve never gotten good at the mechanics. I love seeing how my fellow players create and build relationships with their characters and I am fascinated by the myriad ways that we all try to navigate these fantastic worlds by inhabiting our characters. A well-created world with captivating story hooks and NPCs keeps me enthralled and engaged and coming back for more. 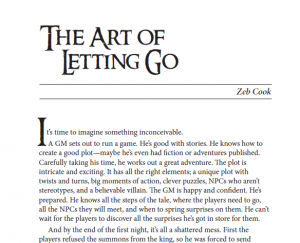 Keeping players engaged can be a tremendous challenge though (which I do not envy my GM) and GMs are not always successful at creating complex but manageable storylines that motivate players to really challenge themselves and their characters. 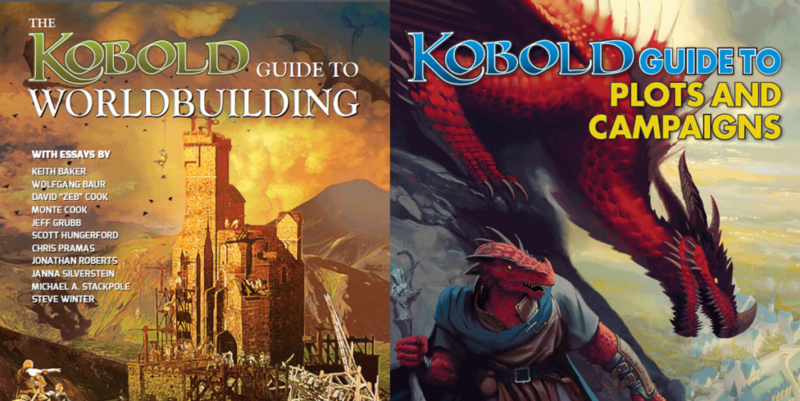 I got to review two books from Kobold Press that are designed to support GMs, authors, and other storytellers with the process of building engaging and nuanced narrative experiences. At just over 120 pages per book, I wasn’t expecting these books to be packed with detail or novel information. The essays—and authors—in this books start by offering design considerations for novelists, game designers, and game masters. They also provide a number of strategies for designing your setting from inside out vs. outside in, building “real” worlds vs. pure fantasy worlds, and incorporating or creating history (conflicts that have shaped the world, legends and children’s stories popular with the citizens of your world) as a grounding element of your world. 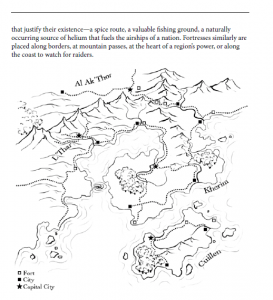 There is a wonderful chapter on creating maps to aid in worldbuilding and help players suspend disbelief. As a literal thinker myself, this chapter is a great reminder that simple things like mountains dotting a landscape rather than being strung in a line can throw us out of the world and require a lot of explanation and justification to get past. Designing nations, cities, and their corresponding cultures and social structures are also included as important parts of the design process. From deciding where in your world people actually live and congregate, to figuring out how they would interact with each other and which customs would be important, these details are part of what makes your world fun to play in. There are chapters devoted to writing religion—including the creation of a pantheon of gods—and religious practices into your world, and tips for creating cults, guilds, and secret societies to make your world more compelling. The book closes with chapters on staying organized, playing in other people’s sandboxes (licensed worlds), and dealing with the limits and constraints that are inevitable in designing a usable world. 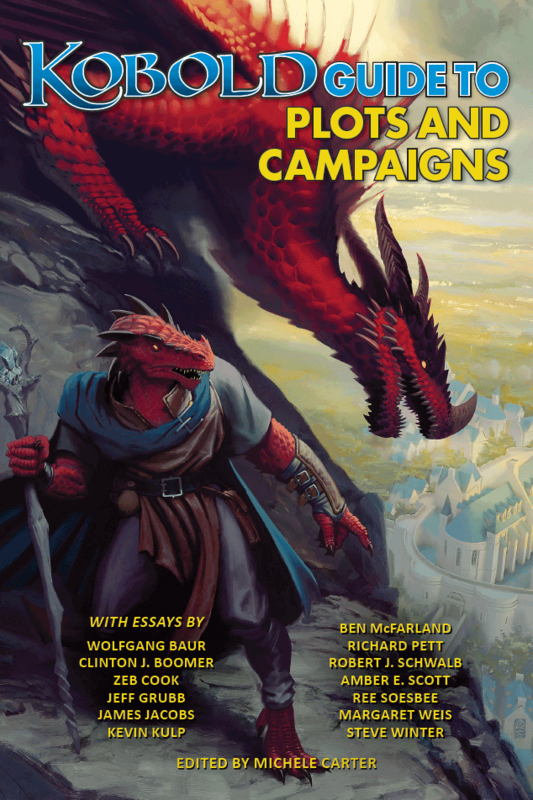 The Kobold Guide to Plots and Campaigns was, start to finish, packed with brilliant chapters by experienced game designers and world builders. This book welcomes us to campaign planning by suggesting that creators/GMs don’t need to present every aspect of the campaign and story to prospective players before (or immediately after) they begin. Providing just enough detail to get players interested in exploring and giving just enough context for players so they can dive right in is fine. Once you’ve got players and a plan you are ready to go! To help with campaign planning, this book has chapters on running published adventures, adapting them to better suit your DM style and group of players, and on plotting — hint: work backwards from the big finale. Although an epic finale may be decided on last minute, having a pre-planned finish can help shape not only the style of play and types of encounters that you encourage, but also helps to keep play from stagnating or seeming to meander aimlessly. An early chapter on plotting reminds us that you (or the designer of the world you are using) have put a lot of effort into making this world matter to your players. Designing a finale that showcases something particular and relevant to your world dials up the thrill of being part the game. For added complexity and unique game play experience, there are chapters that explain how to incorporate and manage evil PCs, ways to leverage unexpected or surreal elements to stimulate the players’ imaginations and move the experience from mundane to otherworldly. One of the greatest strengths of this book is its emphasis on telling a good story. Chapters cover managing the episodic nature of game play, using branching storylines to make the game more interactive (allowing player choices to cause changes to the plot), and techniques for telling co-constructed stories that have developed through traditional oral storytelling—including a complete simple story for DMs to use for practice with improvisation. 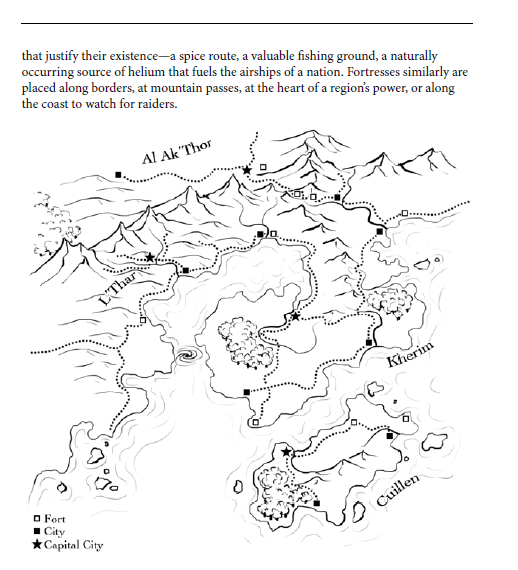 There are also chapters on the complex plotting needed for open-world adventuring and long-term games, creating really juicy hooks to reel your players (and their characters) in to more adventures, and making the most of cliffhangers. 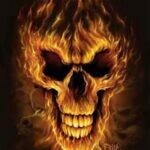 There are also awesome chapters on creating NPCs that are memorable and great fun for players to interact with and on crafting a villain that is as well developed as you players’ characters have gotten to be. 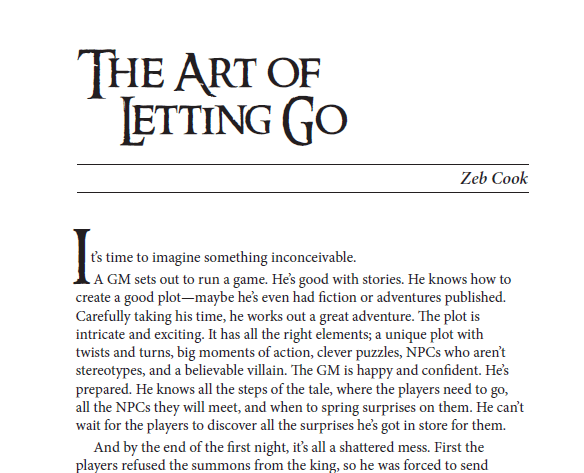 Near the end, Zeb Cook’s chapter “The Art of Letting Go” covers the pivotal shift from storytelling-like-an-author to improvisational storytelling where the players are part of the story creation. While some games are more (or less) improvisational than others, GMs will have to deal with the influence of their players on the shape and path of the story. Relying on tools from improve theater can help prevent or offset the challenges of this type of narrative construction. Although geared towards GMs of RPGs, the wealth of advice and experience that these authors demonstrate in their chapters make this book valuable to people invested in other forms of narrating and storytelling too. These books are not designed to support you if you’re struggling with session mechanics. If you are looking for guidance in crafting a narrative or planning a campaign (or even novel) more broadly then these books are right for you! They’re even great to read as a player because there are so many yummy story ideas and prompts; the books really got my creative juices flowing. This post is brought to you by our wonderful patron Michelle Shepardson, supporting us since December 2017! Thanks for helping us keep the stew fires going! Jasmine is a PhD candidate looking at online communities and fandom/fan engagement. She has a slight obsession with dragons and miniature foods, and hoards books like they are the greatest of treasures. I own Worldbuilding and love it. There’s a lot of great stuff in there. The chapter on map making offered a very interesting technique that I hadn’t seen anywhere else. Before drawing anything, lay your nations out in nodes, and then draw connections between them to represent things like geography, politics, and trade. This helps ground the design of your map AND history by logically explaining things such as why one nation isn’t constantly at war with it’s neighbor. (Answer: because there’s a mountain between them). Please read it and you’ll understand it much better than I can explain! I hadn’t heard of Plots and Campaigns, but I’m going to order a copy shortly. 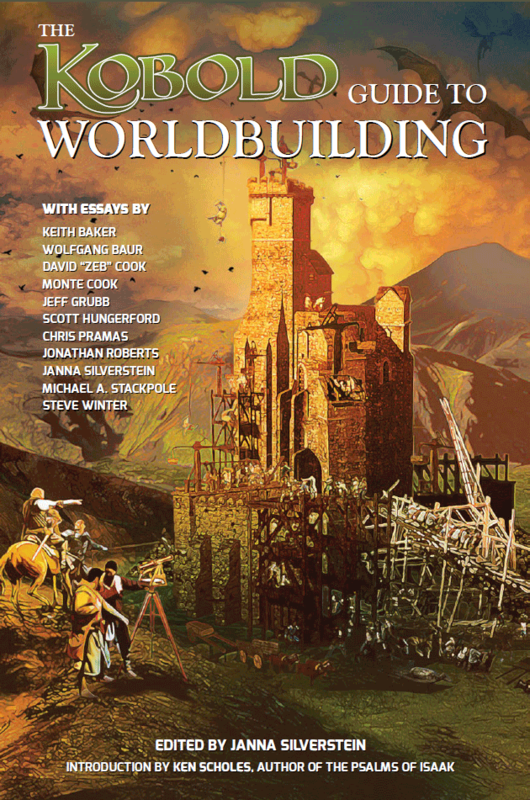 I think the Worldbuilding Guide is probably the best book on the subject I’ve ever read, especially for campaign settings. Understanding that a game setting is made to be played in and not to be looked at is extremely important (and a large number of professionals don’t seem to)and this book does a really good job at explaining what that means in practice. It should be much more popular than it is. I fully recommend it to anyone.